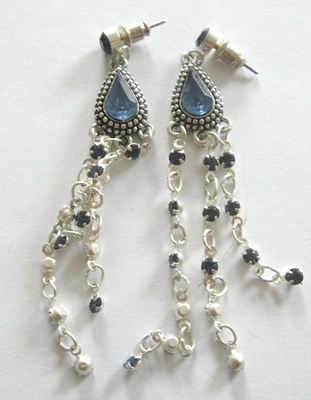 These pretty earrings are made with delicate silver plated silver with pretty blue glass. The main glass is teardrop shape with a silver bobble design around it. Hanging from the teardrop are 3 chains of silver and each chain is in made up of little silver links and more little blue stone. At the top of the earring at the stud is another little sparkling round blue stone. Made for pierced ears only and are studs. Silver plated & comes in a complimentary free pouch.